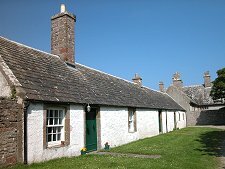 Melsetter House is Hoy's finest house and one of the most significant anywhere in Orkney. It is located close to the southern end of Hoy, with views south over the Pentland Firth, north east along the length of the inlet of Longhope, and east to South Walls beyond the causeway linking it to Hoy. Melsetter House is a private house, but both house and chapel may be visited, by appointment only, on Fridays and Saturdays during May, June and September. Visits can be arranged by ringing 01856 791352. 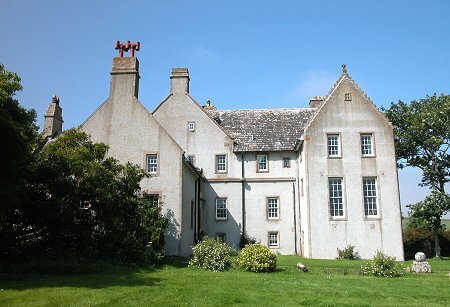 Melsetter House's roots date back to 1738 when an L-shaped two storey laird's house was built here. But in its current form it dates back to 1898. Thomas Middlemore inherited a fortune made in Birmingham in the manufacture of leather bicycle seats and chose to move to Orkney with his wife, Theodesia Mackay, a renowned embroiderer and weaver. Both were disciples of William Morris and they brought in the architect William Lethaby to turn the existing house into something altogether different. What emerged was a three storey country mansion built around a paved courtyard, complete with walled gardens. 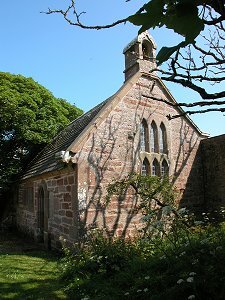 The south wing of Melsetter House incorporated the original 1738 house, while one of the original outhouses was converted to a chapel, dedicated in 1900 to St Colm & St Margaret. The Middlemores succeeded in encapsulating William Morris's philosophy. 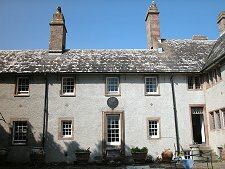 His daughter, May Morris, visited Melsetter and described it as: "A sort of fairy palace on the edge of the northern sea, a wonderful place, remotely and romantically situated, with its tapestries and its silken hangings and its carpets; for all its fineness and dignity is was a place full of homeliness and the spirit of welcome, a very loveable place. And surely that is the test of an architects genius; he built for home life as well as dignity." 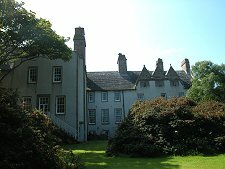 The main entrance to the house is via the courtyard on the western side. Most of the main rooms open off corridors running along the courtyard at ground and first floor level so they can enjoy the garden and sea views. Most of the furnishings were, perhaps unsurprisingly, brought from Morris & Co. The house was unusually egalitarian, and the servants quarters also overlooked the garden. One side of the courtyard is formed by the east gable of the Chapel of St Colm & St Margaret. Externally this is an unassuming building, partially hidden by trees and with rubble walls owing much to the original 1700s outhouse. Internally there can be little resemblance to what went before. 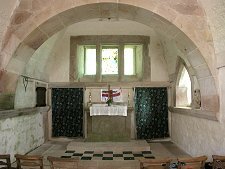 This tiny chapel has a nave and a sanctuary, divided symbolically from one another by an arched bridge at high level. The overall effect is to focus attention on the altar at the east end of the chapel. This is a remarkably peaceful little space and quite unexpected in its setting.